A new study has confirmed that tests for the cancer gene BRCA have continued to soar following Angelina Jolie’s decision to have a double mastectomy after a similar test. BRCA testing rates surged nearly 40% in the week of Angelina Jolie’s announcement that she carried the BRCA 1 gene mutation and had an elective double mastectomy, according to a new AARP Public Policy Institute study released today. This is the first report quantifying an increase in BRCA testing rates among women holding health insurance with a large US company. Prior to Ms. Jolie’s announcement, women with a cancer diagnosis had more BRCA tests than women who did not, the AARP study found. However, during the week of her public announcement, the increase in BRCA testing among women who did not have a cancer diagnosis was nearly twice that of women with a cancer diagnosis. BRCA testing helps identify treatment options for women with the gene mutations before or after they are diagnosed with breast and/or ovarian cancer, according to the National Cancer Institute. “Our study showed that the BRCA testing rate increased about 40% and stayed at an elevated level for the rest of the year after Angelina Jolie’s announcement,” said AARP Executive Vice President for Policy Debra Whitman, PhD. On May 14, 2013, Angelina Jolie announced in The New York Times that she tested positive for the BRCA 1 gene mutation and underwent a preventive double mastectomy to reduce her risk of developing breast cancer. Ms. Jolie’s story gained immediate and widespread international media attention. About 5-10% of breast cancers are thought to be caused by hereditary genetic defects, according to the American Cancer Society. BRCA1 and BRCA2 gene mutations are the most common cause of hereditary breast cancer. Women with either mutation have a high lifetime risk of developing breast and ovarian cancer. 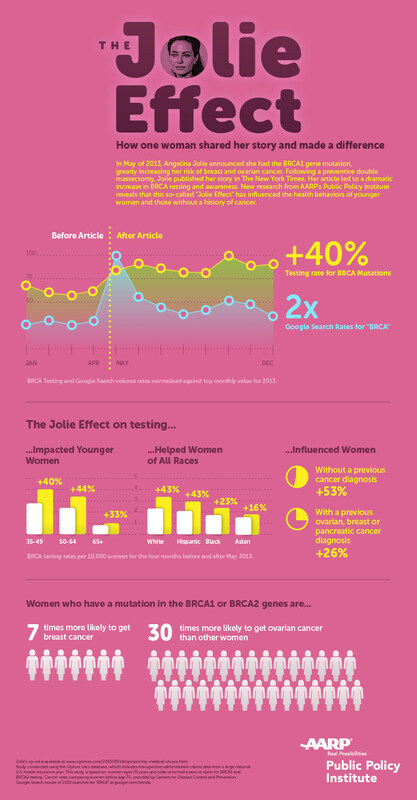 To better understand the so-called “Angelina Jolie effect”, AARP, in collaboration with Optum Labs, compared BRCA testing rates based on claims among commercially-insured women ages 35 and older in the US, before and after Ms. Jolie’s story was publicized in 2013.
followed by women ages 35-49 (40%). women; and 16% among Asian women. AARP’s Public Policy Institute examined the number and rates of BRCA tests among women covered by a large, national U.S. health insurance carrier before and after Angelina Jolie’s May 2013 announcement (January-December 2013). Using data from the Optum Labs database of retrospective administrative claims data, the report also analyzed the age, race/ethnicity, and cancer diagnosis status of women ages 35 and older who received the tests. This entry was posted in Celebrity Health, News and tagged Angelina, Angelina Jolie, BRCA testing, breast cancer by admin. Bookmark the permalink.